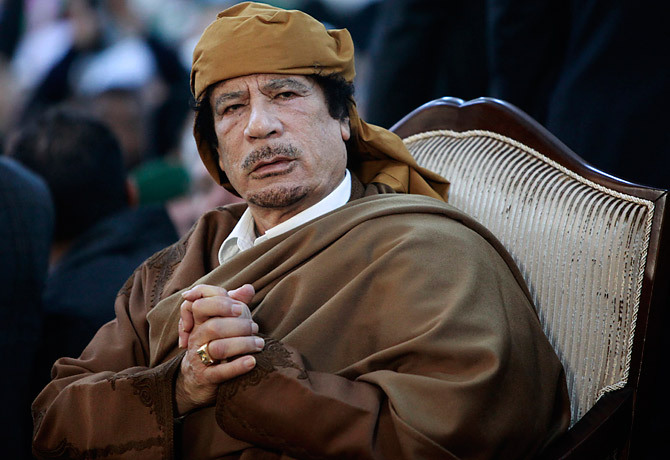 In 2008, Libyan strongman Muammar Gaddafi invited 200 kings and traditional rulers from sub-Saharan, mainly non-Arab Africa to witness his crowning of as the continent's "King of Kings." Currently, however, his links to sub-Saharan Africa are more violently mercenary than wackily ceremonial as consistent reports emerge that he is using fighters from that region to quell the nationwide uprising against his regime. Videos and photographs have surfaced on YouTube and other websites of columns of uniformed black African soldiers driving in jeeps through Tripoli and patrolling the streets of the Libyan capital. Other videos show the bodies of several dead, black African men killed by the protestors, including the corpses of two men being paraded on the hood of a car and driven through a crowd of demonstrators in al-Baida. Another video shows a black African man, who has been caught by the demonstrators, being hit and punched. A protestor asks: "Who is giving you orders?" The man replies: "They come from up high. I swear, I swear...orders, orders." The protestor asks: "They told you to fire at us"? The man replies: "Yes, yes." The Libyan deputy ambassador to the United Nations, Ibrahim Dabbashi, who broke with the regime, warned in a statement that Gaddafi was employing "African mercenaries" to protect the regime. The nationalities of the soldiers are not known, though some unconfirmed reports indicate some soldiers may be French-speaking. The numbers of soldiers is also unknown, although witnesses in Libya claim to have seen several planes land at different airports across the country and disgorge hundreds of fighters  an intervention of sufficient size to suggest a foreign government's complicity in their departure for Libya, if not actual support. "You have to ask: with which militant governments and armed groups did Libya have contacts?" says Petrus de Kock, a senior researcher at the Pretoria-based South Africa Institute of International Affairs. "And the answer is: almost all of them." The fall of Gaddafi would remove at a stroke an eccentric but sometimes disruptive and decisive influence in Africa. More than any other Arab leader, Gaddafi has looked south of the Sahara. Sometimes his influence has been benign. Libya has donated money for humanitarian causes across the continent and also allowed Africans to travel to the country to find work. Gaddafi was also instrumental in the foundation of the African Union as an attempt to institutionalize pan-Africanism and African self-sufficiency. And in recent years, Gaddafi's regime, particularly his son Saif, has emerged as the key mediator in negotiations over Western hostages kidnapped in Mali and Niger by Tuareg rebels or West African Islamists. But self-interest has always underscored Gaddafi's curiosity in Africa. Gaddafi developed an interest in pan-Africanism when pan-Arabism let him down: his fellow Arabs failed to support him in the face of international isolation in the 1980s and 1990s, while some African countries did. Gaddafi has also backed scores of rebel movements across the continent, particularly in Chad, Sudan, Sierra Leone, Liberia and  during the years of apartheid in South Africa  Nelson Mandela and the armed wing of the African National Congress. Like the Irish Republican Army (IRA), Palestinian militants and the forces of former Ugandan dictator Idi Amin, many of these groups underwent guerrilla training in camps in Libya. Once the rebels won power, that support continued, most notoriously in the close relations enjoyed by Gaddafi with his Zimbabwean counterpart, Robert Mugabe. In the last decade, Gaddafi's vision for Africa crystallized in a proposal for a United States of Africa, complete with a single currency, a united military and one common passport. That call for African unity was also the theme of his time as chair of the African Union in 2009, and has found some support  notably from Senegal and Zimbabwe  while the African Union itself has set itself the task of building a "united and integrated" Africa by 2025. But continental powerhouses like South Africa, Kenya and Nigeria oppose the idea, which they regard as an extension of Gaddafi's idiosyncrasy. Gaddafi's calls for unity and stability are at odds with his track record of backing rebellions. Libyans too looked askance at his doling out of billions in their country's oil revenue to foreigners. Says Tawfik al-Shaiby, "He supports all sides, but not our people. I think he said he would send $9 billion to Africa. He sent it. But his people don't have the same rights." As a result, though Gadaffi's fall would resonate more than the demise of other Arab regimes, its effect would be limited. "I don't think an African autocrat can not be concerned if autocracies of 30 or 40 years are being toppled so quickly by people spontaneously organizing," says Adekeye Adebajo, director of the Center for Conflict Resolution in Cape Town. On the other hand, he adds, "He was able to buy influence, but there's not many African countries that actively support him. Even though Gaddafi has long portrayed himself as an African, the support was always opportunistic and never that deep." Likewise, there are real differences between northern and southern Africa that limit the spread of rebellion. There have been copycat protests in northern Sudan, where President Omar al-Bashir  technically sub-Saharan African, but ethnically Arab  has announced that after 22 years in power he will not stand for re-election. But there have been few demonstrations elsewhere. Southern Africans have inequality and widespread government corruption in common with northerners. But with far less internet access, they do not have the same ability to organize and publicize instantly on the internet. The young, educated middle class  the Facebook generation which led the northern African revolutions in Tunisia and Egypt  is generally smaller; and, crucially, in Africa, the army is often inseparable from the regime. See how Libya's second largest city became the first to revolt.